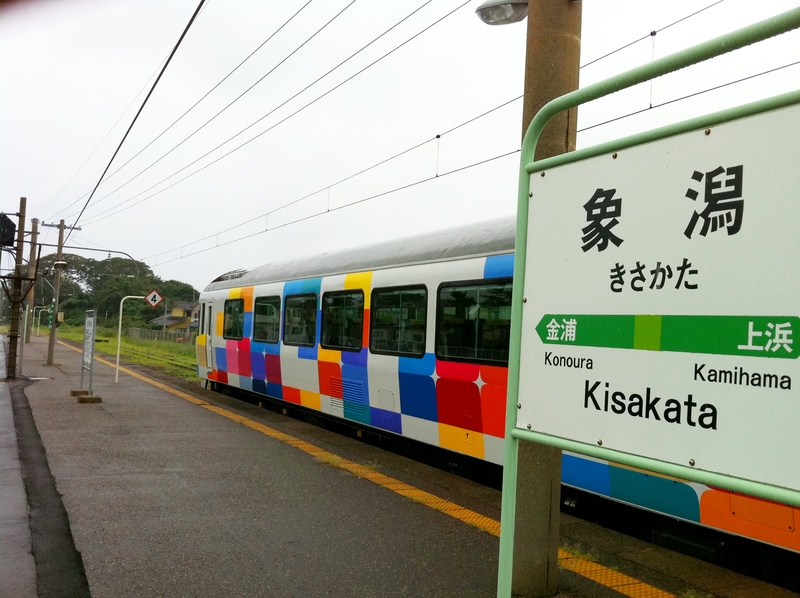 The Kirakira Uetsu is a Rapid Express train running along the Uetsu Line from Niigata Station, and then terminates in either Sakata Station in Yamagata Prefecture, or Kisakata Station in Akita Prefecture, depending on season as the schedule can change. “Kirakira” is the Japanese onomatopoeia for “sparkling” or “glitter,” which is a very suitable name for this train since it cruises along the Sea of Japan coastline for a majority of the trip. Around the end of summer, the timetable aligns with the setting of the sun, leaving passengers with a beautiful sunset and a sparkling horizon beneath it. On this particular day, however, the weather was pretty bad. Not a whole lot of ‘’kirakira’’ to begin with, and as soon as I arrived in Akita Pref., it started pouring, which meant I had to abandon a bicycle ride to a local waterfall in the area. I could have waited for the weather to clear, but I only had about 2 hours until my return train back to Niigata, so the besides riding the train itself, everything was kind of a bust. 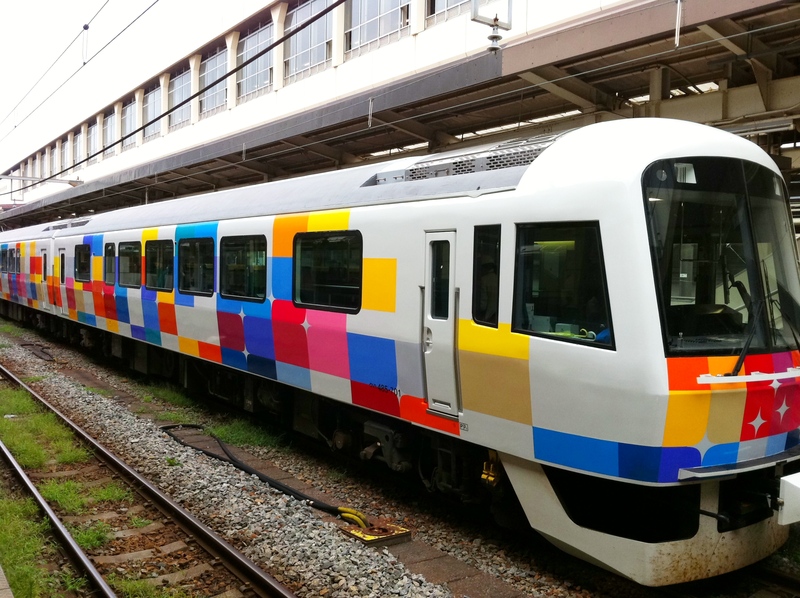 As for the ‘’Kirakira Uetsu’’ itself, it’s probably the most colorful train in the entire JR East rolling stock. 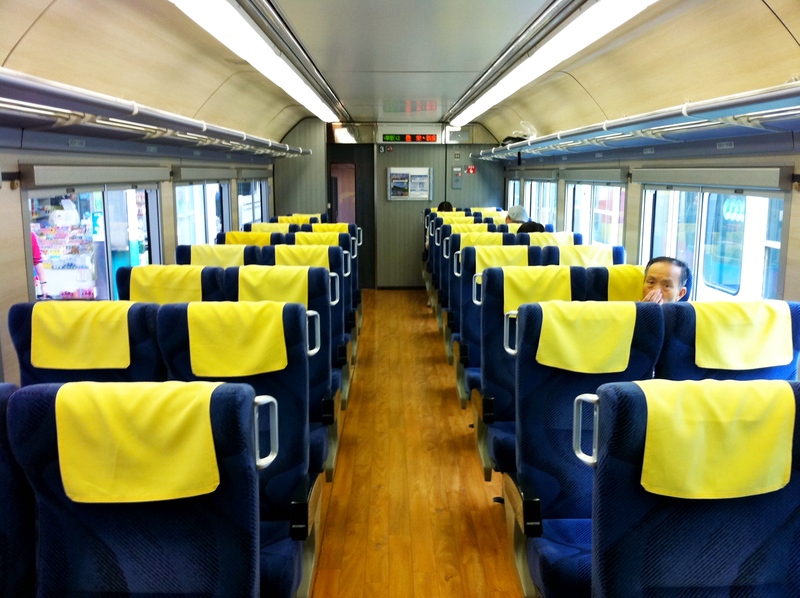 It’s a 4-car passenger train, which seats a total of about 116 passengers. 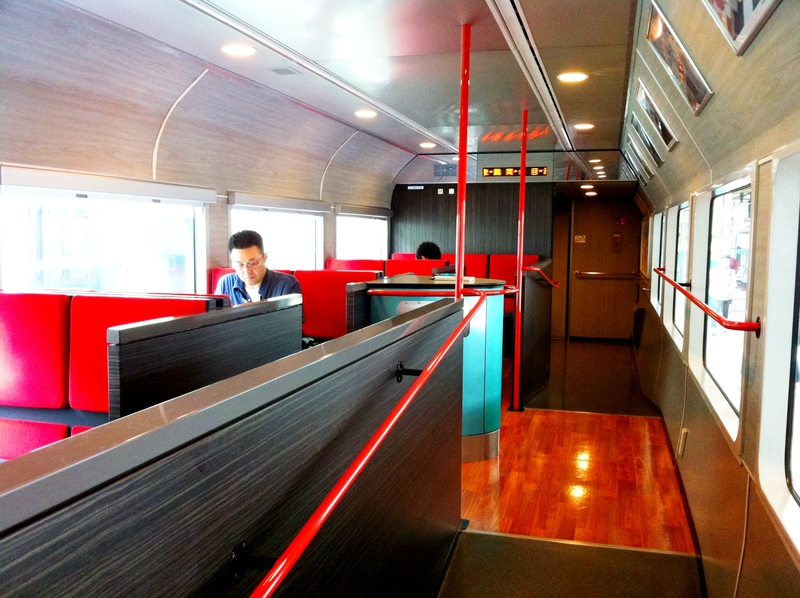 It also includes a lounge car, which passengers can use at their leisure. 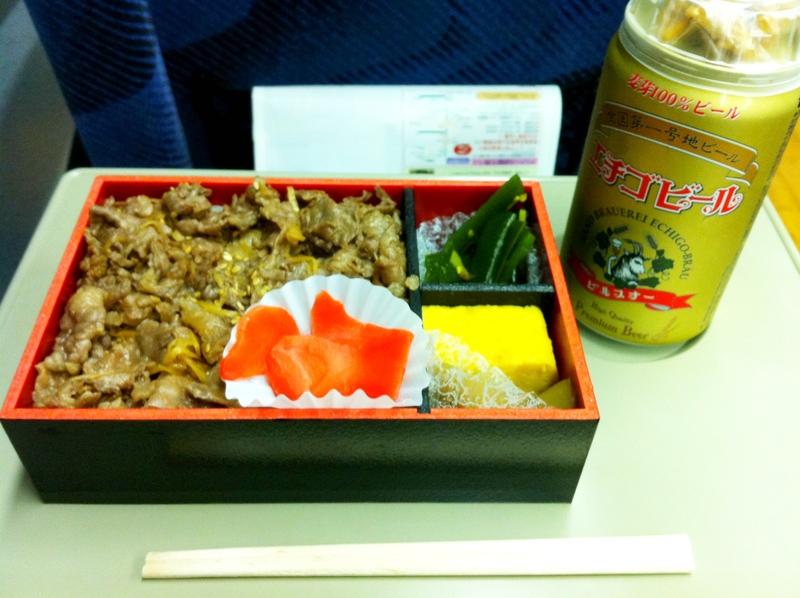 The lounge car includes a small gift shop and snack bar, which offers bento boxes, sandwiches, sweets, and beverages. You can also order a green tea set, which includes enough tea for about 2 to 3 cups (and if you ask the staff, they’ll give you additional hot water, free of charge), a sweet mochi ball dessert, and is served to you in the lounge by an attendant. 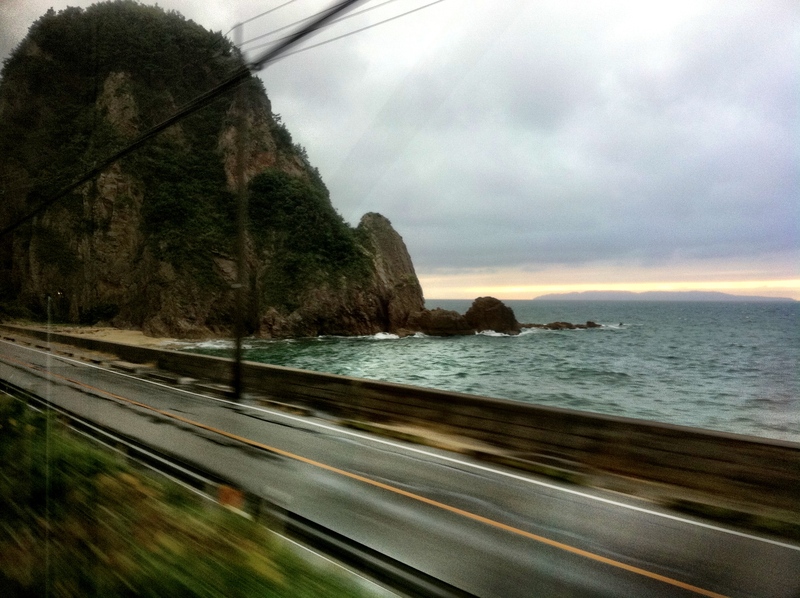 Watching the sea fly by at 120 km/h while sipping on a cup of green tea wasn’t a bad way to spend a rainy afternoon. 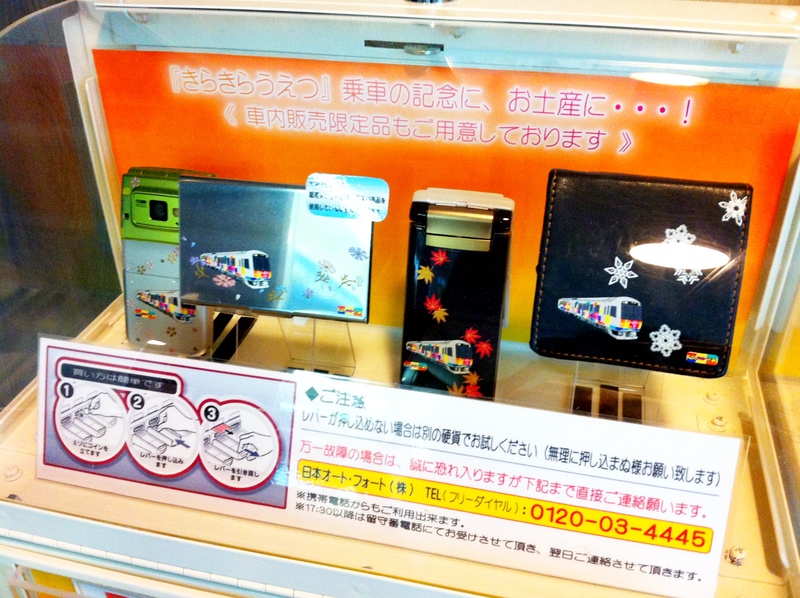 Elsewhere throughout the train, there’s a rubber stamp pad, which includes the train’s logo, a small souvenir machine that sells stickers and other small items, and a small area for kids to color. 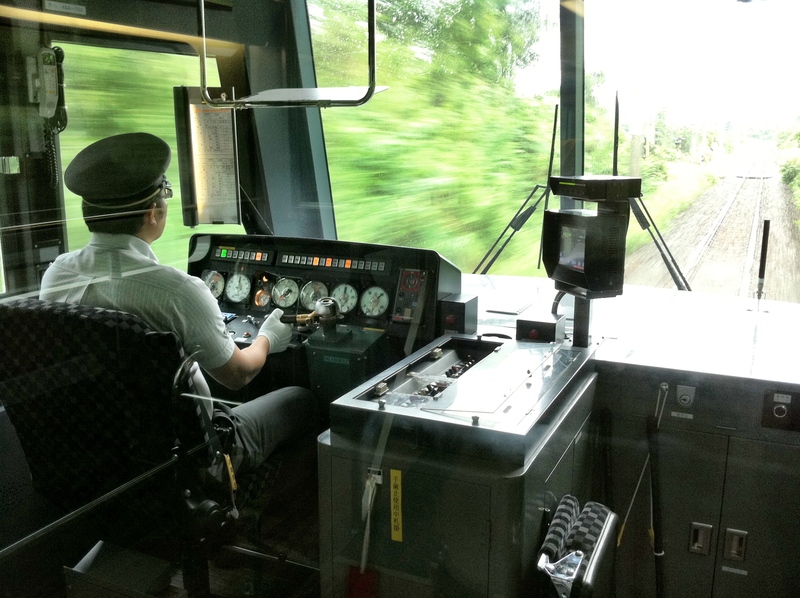 If you walk towards either end of the train, there are huge windows that allow you to peer directly into the driver’s room. You literally get to see what the train driver sees, which proved to be popular with children (like myself). 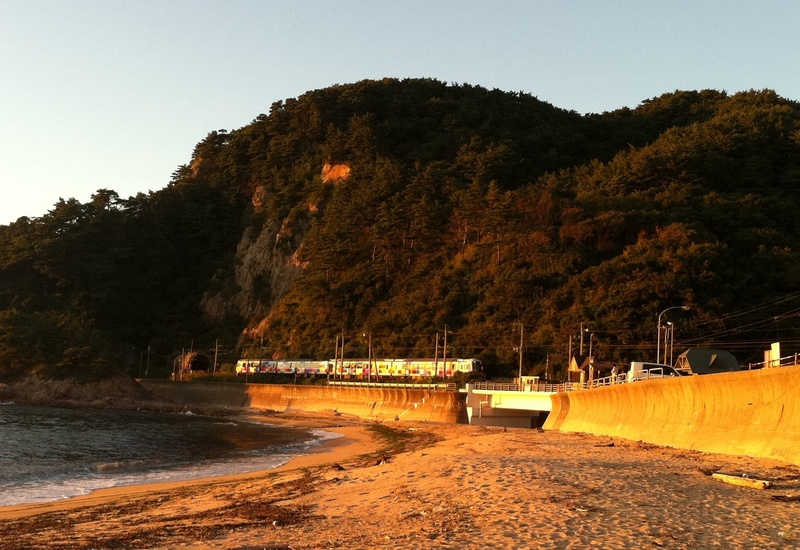 Although I took the train throughout the entire route from beginning to end, there are plenty of other destinations in between that I strongly recommend, especially if you enjoy hot springs or hiking. some hot buns i picked up in kisakata. now, i understand the pig looking ones are filled with pork. 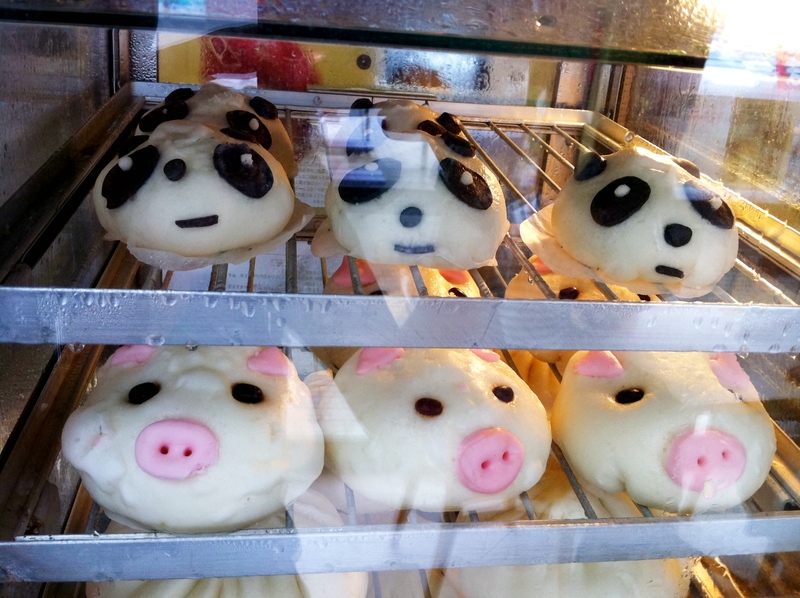 but the panda ones are filled with...? 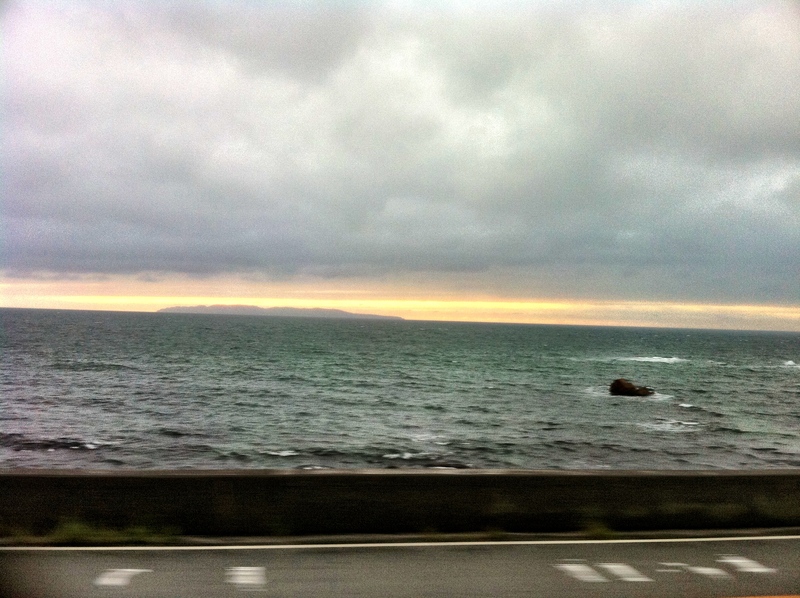 luckily, i got to see a glimpse of a sunset on the way back home. kind of. Finally, I want to finish with a new feature that may be implemented in future editions of Densha de Dan. 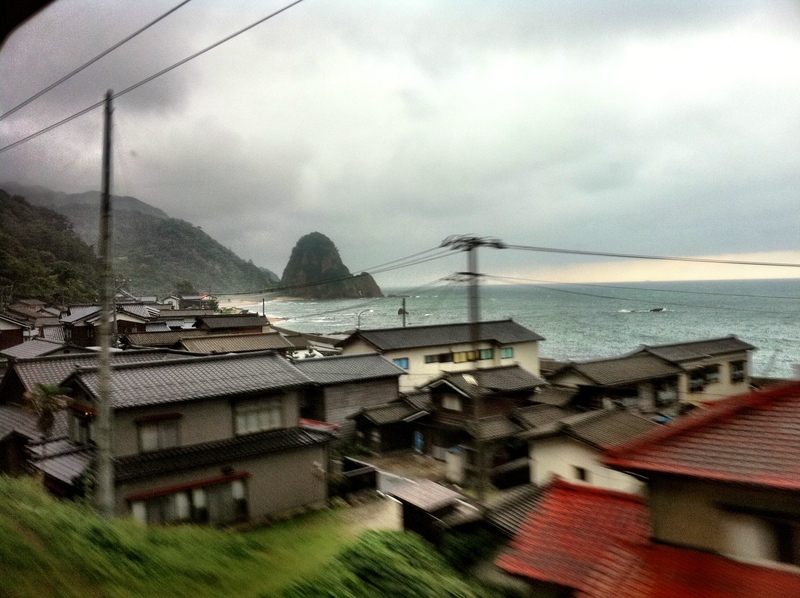 On this train, I look video from the window looking outward, so that way it would give you a chance to see what I see when riding the train. It’ll include different sections of the line, from beginning to end, but I’ll edit it to a short 2-3 minute video. If you think it works well, or I should use more pictures instead, please leave a comment. Positive or negative feedback only makes the blog better! With that, I introduce to you the first edition of Noseprint. Why “Noseprint?” you ask? Well, these videos will give a perspective of planting your face right on the train window. When you lift you’re face away from the window, what’s usually left? A print of your nose. (It’s actually more of a grease smear, but it doesn’t make for a good title). On some days, it only runs in one direction, so caution is advised. Detailed timetable can be found here. 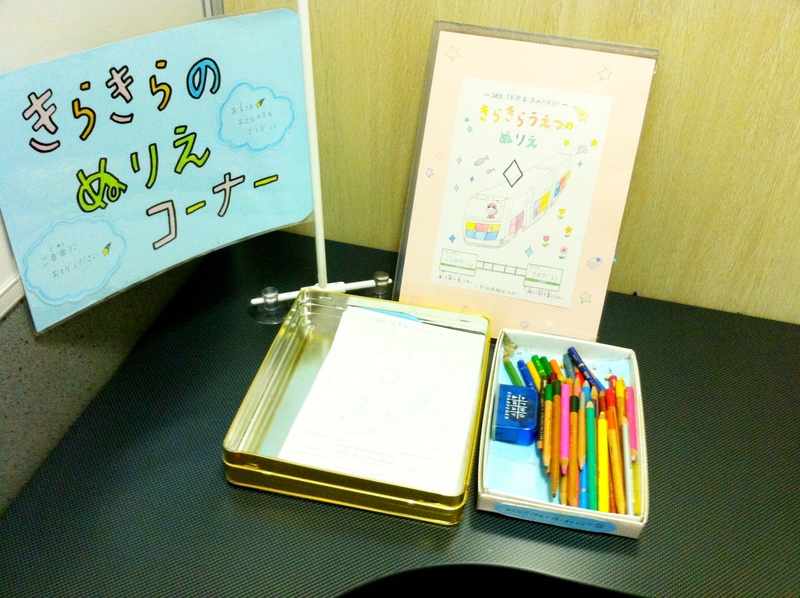 Official JR Pamphlet – Additional English information, with departure/arrival times at the stations. Also has information about using this train in conjunction with the JR East Pass, JR East Pass Special, and Japan Rail Pass. Pamphlet is dated from 2009, but after checking over the information, it remains accurate (as of 11/2011).